Multi-agent systems are considered a modern medium of communication and interaction with limited or no human intervention. As intelligent agents are gradually enriched with Semantic Web technology, their use is constantly increasing. To this end, the degree of trust that can be invested in a certain agent is recognized as a vital issue. Current trust models are mainly based on agents’ direct experience (interaction trust) or reports provided by others (witness reputation). Though, lately, some combinations of them (hybrid models) were also proposed. To overcome their main drawbacks, in this paper we propose HARM, a hybrid, rule-based reputation model based on temporal defeasible logic. 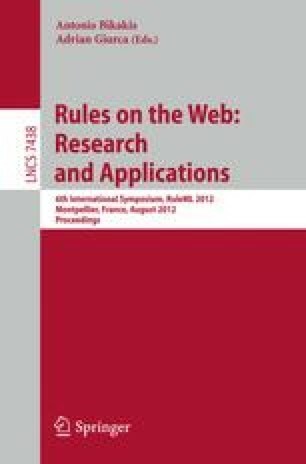 It combines the advantages of the hybrid approach and the benefits of a rule-based reputation modeling approach, providing a stable and realistic estimation mechanism with low bandwidth and computational complexity. Moreover, an evaluation of the reputation model is presented, demonstrating the added value of the approach.